We’d love your help. Let us know what’s wrong with this preview of Don't Ever Look Behind Door 32 by B.C.R. Fegan. This imaginative picture book aims to take children beyond the first ten cardinal numbers, and introduces them to the patterns of counting in The magical Hotel of Hoo is a mysterious place with some very unusual occupants. As our guests explore the strange hotel, they are invited to experience everything it has to offer with just one warning… don’t ever look behind door 32. To ask other readers questions about Don't Ever Look Behind Door 32, please sign up. What is behind the forbidden door? Don't Ever look behind Door 32 is an adorable children's book with delightful illustrations and an emphasis on the patterns of counting. The rhyming is cute, creative and fun! Enter this hotel and look around for a while, what you find might make you smile! The Magical Hotel of Hoo is a magical hotel with very interesting guests/inhabitants who live behind the various doors. Mr. Nicholas Noo, is the host and he encourages his two young guests to take a So Cute!!! The Magical Hotel of Hoo is a magical hotel with very interesting guests/inhabitants who live behind the various doors. Mr. Nicholas Noo, is the host and he encourages his two young guests to take a tour of the hotel and peek inside the various rooms except for Door 32. The illustrations first grabbed my attention. The wide eyed curious children, the creepy and interesting guests of the hotel make this a very magical and engaging picture book. I see this book being a bedtime favorite and a great book for beginning readers. The target audience for this book is K-3 but as I said, this is also a great book to read to your little one! It has interesting characters with a touch of mystery - just why can't we look behind door 32? What's in there? This book encourages reading, the use of imagination, counting, curiosity, and problem-solving skills. The book counts to the number 32 and will maintain a child's imagination through the use of rhymes and the cast of interesting characters behind the doors ranging from zombies, vampire mermaids, monkeys, knights, tea-loving monsters and a maze to name just a few. I received a copy of this book from the Author and Book Publicity Services in exchange for an honest review. From the moment I picked up this book, I was eager to jump right in and find out what was behind door 32! The cover is mesmerizing with the wide-eyed characters peeking out with the open door that seems to be inviting the reader in. Hotel Hoo looks like a magical, medieval castle and the story takes us on a journey door by door. Along with the first 2 guests, we meet all the occupants from the fidgety knights fixing the lights to the cute little elves, tea loving monsters, grumpy old c Adorable!!! Hotel Hoo looks like a magical, medieval castle and the story takes us on a journey door by door. Along with the first 2 guests, we meet all the occupants from the fidgety knights fixing the lights to the cute little elves, tea loving monsters, grumpy old clowns and more. We are warned repeatedly throughout never to look behind door 32. As an early childhood certified reading specialist and teacher, I am always looking for books that will spark interest and provide learning opportunities. The title even tempted me to hurriedly turn to the last page to find out who/what was waiting behind door 32! The whimsical illustrations teamed up with the rhyming prose will keep children engaged and spark imagination. The title enhances the readers curiosity and gives them an opportunity to predict throughout the story just what is behind the last door. We also have number sequence and recognition 1-32, endless counting opportunities, vocabulary development and just plain fun! I love this book and highly recommend! A counting book with a difference, Don’t Ever Look Behind Door 32 extends the counting experience beyond 20 to 32. The illustrations are delightful and a little bit spooky as a young boy and his little sister arrive to stay at the Magical Hotel of Hoo, a sprawling old castle dimly lit by moonlight. Nicholas Noo the amiable hotelier shows them around each room. Being the first guests at the hotel their room will be room1 and the reader learns that most of the other rooms are permanently occupied b A counting book with a difference, Don’t Ever Look Behind Door 32 extends the counting experience beyond 20 to 32. The illustrations are delightful and a little bit spooky as a young boy and his little sister arrive to stay at the Magical Hotel of Hoo, a sprawling old castle dimly lit by moonlight. Nicholas Noo the amiable hotelier shows them around each room. Being the first guests at the hotel their room will be room1 and the reader learns that most of the other rooms are permanently occupied by an ever increasing number of ghouls and creatures. Dragons, elves, monsters, ghosts, goblins and giants all have a room and a purpose. The cadence is spot on with this rhyming story which makes for an easy read as the words flow effortlessly. The suspense builds as the pages turn and the children are reminded throughout, never to look behind door 32. My almost 4 Granddaughter loves everything spooky and even after reading the book over and over she still became excited as the tension mounts to that last door. She charmingly calls it the Transylvanian door story. She’s not quite up to counting to 32 which gives the advantage of extending the book as the child grows. This fun children’s rhyming book follows two little kids as they check into a magical hotel call Hoo. On arrival, they are greeted by the owner, Mr. Nicholas Noo who puts them up in room number one, he tells them to go and explore his hotel, but they must not look behind door 32. The children travel throughout the hotel, going from room to room, coming across lots of weird and wonderful characters, animals, and creatures that are residing behind each door, until they reach door 32. Will they dare to sneak a peek? Upon opening this book, the first thing that I noticed was how beautiful the full page illustrations are. They are bright, colourful, eye catching and have a slight Gothic look to them. Each time the children visit a different room they meet characters that will help stretch their imaginations, they also get reminded not to look behind door 32, creating an air of suspense and mystery as to what could be behind the door. I can see this being a great talking point as the child reading the book, or a class, could try guessing what is going to be behind the door. Don't Ever Look Behind Door 32, written by B.C.R. Fegan and illustrated by Lenny Wen offers a suspenseful tale that teaches numbers up until thirty-two while delighting children with its colorful pages, unique creatures, and rhyming verse. My granddaughter Sophia is three and a half and could barely contain her curiosity in her hunt to discover what was behind Door 32. Baby witches casting spells, ghost chefs and elves are just some of the paranormal creatures living at Hotel of Hoo. "In number 1 Don't Ever Look Behind Door 32, written by B.C.R. Fegan and illustrated by Lenny Wen offers a suspenseful tale that teaches numbers up until thirty-two while delighting children with its colorful pages, unique creatures, and rhyming verse. My granddaughter Sophia is three and a half and could barely contain her curiosity in her hunt to discover what was behind Door 32. Baby witches casting spells, ghost chefs and elves are just some of the paranormal creatures living at Hotel of Hoo. "In number 16 is the bathroom of gold. The toilets look great but the seats are quite cold. Don't go and seek out door 32." Don't Ever Look Behind Door 32 by B.C.R. Fegan Illustrated by Lenny Wen is about a (presumably) brother and sister who are staying in the Hotel Hoo under the supervision of Mr. Noo (adorable right). They wander through the hotel with the only instruction to not look behind door 32. As the two children look in each room they encounter vampire mermaids, trolls, and other mythical and magical creatures. But what could possibly be behind door 32? This book goes over numbers 1-32 in a fun and inventive way. It's written in a rhyming style (think Dr. Seuss) where you have to catch the rhythm for the book to really flow. I really enjoyed the art style of the illustrations. I found the big eyes of the main boy and girl adorable, and the mysterious Mr. Nicholas Noo has a friendly but sinister appearance about him. I asked Mays, my 9 year old, what he thought of the book and he said that it was funny and cute. So there's that too. This would be an excellent book to read aloud with your child or for you to take turns reading sentences for early readers. I can see this definitely being a bed time favorite. I think this book can be used not only to go over numbers but also to lay the foundation for boundaries and following directions. There weren't many cons about the book. One is I think the number 32 is kind of arbitrary and the ending (from an adult's standpoint) was kind of dumb, but I see it's merits. Nothing that would take away the enjoyment of the book from the children's enjoyment. As soon as you open the book, you’re greeted by the friendly yet mysterious Mr. Nicholas Noo, who invites you to tour his magical Hotel of Hoo. As his very first guests, he’s eager to share the surprises hidden by each door of the haunted mansion. His only condition, don’t ever look behind door 32. Young ones will be eager to see what each door reveals. They’ll meet dancing zombies, miniature giants, baby wizards, unusual pets and so many more delightful and sometimes frightful beings. Fegan’s rh As soon as you open the book, you’re greeted by the friendly yet mysterious Mr. Nicholas Noo, who invites you to tour his magical Hotel of Hoo. As his very first guests, he’s eager to share the surprises hidden by each door of the haunted mansion. His only condition, don’t ever look behind door 32. Young ones will be eager to see what each door reveals. They’ll meet dancing zombies, miniature giants, baby wizards, unusual pets and so many more delightful and sometimes frightful beings. Fegan’s rhyming prose makes this one you’ll want to read aloud as narrator Lenny Wen bedazzles you with his vivid and colorful illustrations. The suspense builds as you’re frequently reminded not to open door number 32. What ever could it be hiding? Nope, not gonna tell ya. I found this book a delightful adventure. I have the hardcover edition and got the full benefit of the fabulous illustrations and couldn’t wait to find out if anyone peaked behind door 32. You’ll want to keep this close at hand as I’m sure it will become a family favorite to read over and over again. Don’t Ever Look Behind Door 32 is a cute picture book that takes place in the Magical Hotel of Hoo. The book features several teaching points for children. At the Magical Hotel of Hoo, host Mr. Nicholas Hoo, takes a couple of guests through a list of rooms. Some feature guests, others feature residents. As Mr. Hoo goes from room to room, children reading the story will learn to count past 10. Young readers will also view vibrant and interesting pictures of the hotel and its inhabitants. Children Don’t Ever Look Behind Door 32 is a cute picture book that takes place in the Magical Hotel of Hoo. The book features several teaching points for children. At the Magical Hotel of Hoo, host Mr. Nicholas Hoo, takes a couple of guests through a list of rooms. Some feature guests, others feature residents. As Mr. Hoo goes from room to room, children reading the story will learn to count past 10. Young readers will also view vibrant and interesting pictures of the hotel and its inhabitants. Children will also see and being to understand how important it is to listen to and follow directions – like not looking behind Door 32. Young readers will also enjoy the easy words and rhyming pattern of the story. A must read for beginners. Don’t Ever Look Behind Door 32 had me and the kiddo oooohing and ahhhhing even before we flipped the cover open to reveal the first page. The cover illustrations are so full of life, you just know that this book is going to be a blast! Don’t Ever Look Behind Door 32 is packed with fun-to-read rhymes that will have you and your little one giggling and counting all the way up to 32. Plus, there’s a wonderful collection of very interesting characters and one very mysterious room and who doesn't love Don’t Ever Look Behind Door 32 had me and the kiddo oooohing and ahhhhing even before we flipped the cover open to reveal the first page. The cover illustrations are so full of life, you just know that this book is going to be a blast! Don’t Ever Look Behind Door 32 is packed with fun-to-read rhymes that will have you and your little one giggling and counting all the way up to 32. Plus, there’s a wonderful collection of very interesting characters and one very mysterious room and who doesn't love a good mystery? But before you even get to room 32, you first must take a tour of the other 31 extra zany rooms in the magical Hotel of Hoo! You'll be glad you did! This book is excellent for reading aloud as a family and helping your little one practice counting beyond ten. And don’t worry, the kiddos are sure to stay engaged as they meet outlandish characters like vampire mermaids and fidgety knights! Moms and dads, you’ll even pick a favorite room, too! I personally liked the evil fairies! Whether you are a parent, grandparent, or teacher - this book belongs in your collection for your littlest readers. My 5 year old son loves this books. He looks forward to reading it before bed and participating in all the counting activities on each page. I have to say, I was hooked just as much as my kids were! I seriously HAD to know what was behind door 32!!! But SH! I won't tell you! My kids were on the edge of their seat as we read and counted through this book. Fantastic illustrations, great story, a big win for my kids. In Short: A cute book with fantastic art and fun rhymes. Every page takes the child on an adventure to a different room of the magical hotel, teaching them to count from 1 to 32. In the last room they learn the central moral of the story which is simply to respect other's privacy. I recommend this book to children who are reaching that age where they don't understand privacy and for fans of movies like "Despicable Me," "Hotel Transylvania," or "Coraline." Pros: The first thing I noticed was the a In Short: A cute book with fantastic art and fun rhymes. Every page takes the child on an adventure to a different room of the magical hotel, teaching them to count from 1 to 32. In the last room they learn the central moral of the story which is simply to respect other's privacy. I recommend this book to children who are reaching that age where they don't understand privacy and for fans of movies like "Despicable Me," "Hotel Transylvania," or "Coraline." Pros: The first thing I noticed was the art. It is beautiful! One of the most visually striking children's books I have read, ever. The story is really simple but fun. Each page takes you to a different room with magical creatures. I'm sure kids will pick favorite rooms that they would want to visit at the magical Hotel of Hoo. The Seuss-like rhymes are really fun and make this book great to read out loud. It is easy to read but there is some advanced vocabulary, great for learning new words. What a cute story! My 3 year old really enjoyed reading this book, and quite frankly, so did I. Although she didn't really 'get' the ending being that she is so young, that's ok-there was still lots of learning to be had throughout the duration of the read aloud itself. And even with my 3-year old daughter's extremely short attention span, she still sat and listened to the whole entire story, and late at night, too. That, to me, is the highest compliment an author of a children's book can get! T What a cute story! My 3 year old really enjoyed reading this book, and quite frankly, so did I. Although she didn't really 'get' the ending being that she is so young, that's ok-there was still lots of learning to be had throughout the duration of the read aloud itself. And even with my 3-year old daughter's extremely short attention span, she still sat and listened to the whole entire story, and late at night, too. That, to me, is the highest compliment an author of a children's book can get! The counting in the book was what really stood out to both my daughter and me, as my little girl loves numbers (as do I). This book went beyond the typical 0-10 or 0-20 digit range most children's books stay within, being that it was written more with 5-6 year olds in mind than the preschool set, I presume. When I read this book to her, my daughter tried hard to read the double-digit numbers as they came about (frequently) in the story, and to my surprise, after a little while, she read them successfully, in many cases! My daughter also found the rhythm and rhyme of the book to be quite enjoyable, as well as the predictive repetition of some of the words. After a while, she would shout out "thirty-TWO"! as appropriate. This made my kid quite happy as 1. she likes to shout and 2. she was proud of herself for "reading" the words, herself! My daughter and I also enjoyed the vivid illustrations by the talented Lenny Wen very much as well, and she learned the valuable lesson that ghosts and zombies don't have to be scary- they can be funny, too! The mermaid and fairy characters were also a big hit, I have to say. I've had the opportunity to read a couple of other books by B.C.R. Fegan, and have loved all of them, so when the opportunity to give this one a read came around, I jumped at the chance. And once again, Fegan does not disappoint. This book is so much fun. It's a great book for both working with counting and rhymes (my early childhood specialization is coming out, sorry), and I'm so sure that kids will love a silly, strange story suc I received a copy of this book in exchange for an honest review. This book is so much fun. It's a great book for both working with counting and rhymes (my early childhood specialization is coming out, sorry), and I'm so sure that kids will love a silly, strange story such as this. There are so many great things going on in this book, and I can totally see this book being placed in on every preschool bookshelf. This story is told so well. I read this aloud to my partner, and it was so easy to read and flowed so well. The words and characters and explanations just work together so beautifully, and while I want to know more about all of these rooms, it was just enough to make it work. As always with Fegan's books, the illustrations are beautiful. Lenny Wen did an amazing job of capturing the atmosphere of the story and going above and beyond with the detail and colours. I liked the ending! There are some reviews I've read saying that it's underwhelming and such, but I thought it was cute and would be an awesome way to bring up topics related to it. I honestly only have one downside for this book, and it's the fact that I noticed some issues with plurals and possessives in the writing. The way they were written makes sense, because it flows for the poetry aspect, but there were missing apostrophes where one needed to be, which threw me off when I read it aloud. It's a little thing, but it should have been checked (though maybe it was just my copy? I haven't seen anything else being said about this). Well I have to be honest and say that I probably love this book just as much as my children. I really enjoyed the added suspense within the book as we work our way through the hotel until we finally reach door 32. It definitely left us all curious to see what is in each room. The question is what is behind this mysterious door? This story really is a pleasure to read and flows very well, it is not only a very fun and entertaining story but it also has an educational side to it. With it introducing your child to a higher number than other books may show. With a lovely rhyming style, inventive creatures and mysterious situations this book is a dream to read. The age range for this book is 3-8 which made it perfect for my three and five year old. I will say that I think my five year old is possibly a bigger fan than his younger sister but she still loves sitting with us and enjoying the various surprises behind each door. I love the illustrations within this story they are eye catching with plenty of contrasting colours using both dark and light to really capture my little ones attention. Both of my children really engaged with the pictures as they showed me the various details that they had spotted. This book has been read every single bedtime since it arrived in the post and I'm sure it will continue to be a favourite for quite some time. Don't Ever Look Behind Door 32 will definitely spark your little ones imagination. A fun, engaging and suspenseful book, we loved it! Mr. Fegan has provided a children’s book that is full of wonderful and imaginative descriptions of the surprises hidden behind each door, along with a rhyming narrative. It’s written in a fun poetic style that will appeal to all children. Because the book goes beyond the cardinal numbers 1 through 10, children can easily grasp the fundamentals of higher numbers through characters or items that add up to the room’s number. In short, the book provides an exciting concept of a mystery by allowing c Mr. Fegan has provided a children’s book that is full of wonderful and imaginative descriptions of the surprises hidden behind each door, along with a rhyming narrative. It’s written in a fun poetic style that will appeal to all children. Because the book goes beyond the cardinal numbers 1 through 10, children can easily grasp the fundamentals of higher numbers through characters or items that add up to the room’s number. In short, the book provides an exciting concept of a mystery by allowing children to discover items hidden behind each door, while simultaneously teaching them to count to and beyond 10. Not enough can be said about the exquisitely rendered illustrations throughout this 8” x 10” book from TaleBlade Press. Each full color page has fanciful scenes that perfectly complement the narrative. The illustrator, Lenny Wen, has rendered the characters with expressive eyes that reveal virtually every emotion, and settings that draw the reader into the story with finesse and fun. Don't Ever Look Behind Door 32 is a children's picture book with counting and a fun take on creepy creatures. A boy and a girl are staying at the Hotel Hoo where the proprietor tells them that they can explore everywhere except for behind Door 32. Of course, they proceed to look behind every door (counting) where they find lots of mythical creatures. Ghosts, vampire mermaids (this one made me laugh! ),evil fairies, trolls, zombies, and on it goes, all leading to the expected pinnacle o Very cute! Don't Ever Look Behind Door 32 is a children's picture book with counting and a fun take on creepy creatures. A boy and a girl are staying at the Hotel Hoo where the proprietor tells them that they can explore everywhere except for behind Door 32. Of course, they proceed to look behind every door (counting) where they find lots of mythical creatures. Ghosts, vampire mermaids (this one made me laugh! ),evil fairies, trolls, zombies, and on it goes, all leading to the expected pinnacle of creepiness behind Door 32. Of course, the end of the book humorously subverts expectations when we finally get to look behind the forbidden door and find only a cozy bedroom where the hotel proprietor lives. I am always a fan of books that offer a light-hearted take on things that have the potential to be scary, so I really enjoyed this one. The real test though is that my (nearly) 4-year-old son is now OBSESSED with this book! He absolutely loves it. In fact, my poor husband had to read it twice in a row last night. Mwahaha! Really though, I think it's a great pick for kids age 3-6 or so. These days, parents may have trouble trying to find new children’s books, preferring to stick to familiar classic. Every now and then, however, we find one that is fun, engaging and well illustrated. 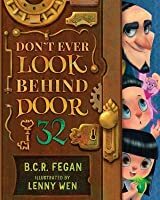 This is the case with Don’t Ever Look Behind Door 32 by B. C. R. Fegan, with illustrations by Lenny Wen. It has the whimsical tone you would expect from a children’s book. With constant warnings to avoid looking behind door 32, you can expect the child’s curiosity to grow with each page. With a delig These days, parents may have trouble trying to find new children’s books, preferring to stick to familiar classic. Every now and then, however, we find one that is fun, engaging and well illustrated. This is the case with Don’t Ever Look Behind Door 32 by B. C. R. Fegan, with illustrations by Lenny Wen. It has the whimsical tone you would expect from a children’s book. With constant warnings to avoid looking behind door 32, you can expect the child’s curiosity to grow with each page. With a delightful rhyming structure, any youngster is sure to find it entertaining. You will enjoy reading this book to your child, and the rich, colorful illustrations will never get boring. It adds so many of the elements that children today are familiar with, such as clowns, ghosts, zombies, and goblins. They are all presented in a fun, cartoonish manner. As children’s books go, this is definitely one with fresh concepts and a nice surprise at the end. Don't Ever Look Behind Door 32 by B.C.R. Fegan is another brilliant children's book. This one is beautifully illustrated. Captivating to look thorough and easy to follow along. The words are just engaging. The words rhyme together and bring a variety of characters to children everywhere. Overall, this entertaining journey was educational, funny, and full of mystery. I highly recommend Don't Ever Look Behind Door 32 to all parents, guardians, and teachers. I received this copy from the publisher. Don't Ever Look Behind Door 32 by B.C.R. Fegan is another brilliant children's book. This one is beautifully illustrated. Captivating to look thorough and easy to follow along. The words are just engaging. The words rhyme together and bring a variety of characters to children everywhere. Overall, this entertaining journey was educational, funny, and full of mystery. I highly recommend Don't Ever Look Behind Door 32 to all parents, guardians, and teachers. "Don't Ever Look Behind Door 32" is an adorably illustrated counting books for children. It is perfect for kids of all ages, but is even better suited for kids 5-8. This counting book is told in rhyme and goes from number 1 to 32. Although that does seem to be a large amount for a children's book, considering most only go to ten, it is told perfectly and keeps the kids guessing what will be behind the next door. Mr. Nicholas Noo is our host and he takes two young children on a tour of his myster "Don't Ever Look Behind Door 32" is an adorably illustrated counting books for children. It is perfect for kids of all ages, but is even better suited for kids 5-8. This counting book is told in rhyme and goes from number 1 to 32. Although that does seem to be a large amount for a children's book, considering most only go to ten, it is told perfectly and keeps the kids guessing what will be behind the next door. Mr. Nicholas Noo is our host and he takes two young children on a tour of his mysterious hotel. He invites them to explore however they feel fit with only one warning; don't ever look behind door 32. He begins the tour at door number one, which is their room, and as they explore each room, the kids meet several entertaining characters. They range from ghosts in the kitchen, to elves in the library and so many more. A charming read from beginning to end. This book had our littles giggling continually and begging for us to hurry to the next door. A thoroughly enjoyable story; perfect for anyone young at heart. Very cute! My kids loved reading along with me, and love naming all the creatures! Super fun art, also! Though marketed at those aged three to eight years, still a big child at heart, I adored this book (as I'm sure its target audience will) with its grumpy clowns, its dancing zombies, its .... I could go on but why spoil the surprise that awaits visitors to the magical Hotel Hoo? Delightfully spooky, educational and great fun. The imagination stretched, the suspense palpable, the second-person narrative drawing the reader in, encouraging discussion as to just who (or what) we'll find behind each d Though marketed at those aged three to eight years, still a big child at heart, I adored this book (as I'm sure its target audience will) with its grumpy clowns, its dancing zombies, its .... I could go on but why spoil the surprise that awaits visitors to the magical Hotel Hoo? Delightfully spooky, educational and great fun. The imagination stretched, the suspense palpable, the second-person narrative drawing the reader in, encouraging discussion as to just who (or what) we'll find behind each door as we visit each room counting from one through to thirty .... thirty? Hmm, we are told 'Don't Ever Look Behind Door 32' but do we? Written in rhyme, the author using only the words necessary to the story; nothing more and nothing less, making it a delight to read. The illustrator meanwhile shows us the characters and the hotel they inhabit. Beautifully done, the colours vibrant, I've read the book several times now and have always come away having spotted something new. Summed up, as for as I'm concerned it ticked all of the boxes that make for a great children's read. Dare you look behind door 32? I certainly hope so. Received for review. This is a new favorite at our house. Everyone is amused-- from my 3-year-old to my 13-year-old. Plus me. The text it fun and the illustrations are great. I was excited -- yes, really -- to get the email from TaleBlade asking if I'd like a copy of this book. Fegan/Wen's previous book, Henry and the Hidden Treasure, was one of my favorite books of last year. Could they live up to that one? Thankfully, they could at least come close. In these pages, Mr. Nicholas Noo takes two children on a tour of "the magical Hotel of Hoo" showing them all the wonderful things in store and repeatedly warning t This originally appeared at The Irresponsible Reader. In these pages, Mr. Nicholas Noo takes two children on a tour of "the magical Hotel of Hoo" showing them all the wonderful things in store and repeatedly warning them, "Don't Ever Look Behind Door 32." He shows what's behind every other door in between the warnings, most of which is wonderful, some of which is just . . . odd (which I prefer, really). Unlike Disney's Beast, however, Noo does more than tell the children not to go somewhere, he ultimately tells them why they shouldn't go there. I can't tell you what a pleasant change that is -- even if this book is intended for kids -- to get a book where a character just tells the others characters everything they need to know to react in a responsible manner. But this isn't the place for that rant (as tempting as it is). This book isn't as good as last year's Henry and the Hidden Treasure but it's close -- the last page or so of Henry was a sweet note, this ended with a reveal/punchline. Is it bad? No -- not at all, it's just not as good in my eyes. That said, a punchline ending isn't going to satisfy even a 3-4 year old on the 32nd read through (at least not on its own), but Fegan and Wen don't rely on that -- the book is full of jokes, clever lines, visual wonder, and lots of things to pay attention to along the way. Sure, you want the book to be appealing to kids, but the real key to success for a kid's book is appealing to parents/grandparents/caregivers. They're the ones who have to read, reread, rereread, and rereread again these things. Dr. Seuss and Sandra Boyton enjoy long-lived success because adults enjoy reading them. I think I judge books like this on this standard, but I rarely do it self-consciously. This is one of those books that adults can have fun with even on the fourth "just one more time" of the night. Which has nothing to do with the big reveal at the end, but the trip you take along the way. I'd say something neat about the typeface -- it's part of the look of the book, it's fair game. But I say anything beyond "even the typeface is great looking" I'll show I have no idea what I'm talking about, so that's all I'm going to say there. I can honestly say that I never envisioned having this much to say about a 32 page book, but once I got started, I couldn't really stop. I really dug this book, you will, too -- especially if you have kids to read it to. Hotel of Hoo is a beautiful and magical place. It is full of wonder and there is a lot to see. However, the one Mr. Nicholas insists upon is never ever to go beyond door umber 32. He repeats this warning over and over throughout the tour. You know how being told not to do something only makes it more appealing? The power of that which you cannot have is real and alive. Behind every door leading up to door 32 is a surprise. One that the children cannot guess but still find exciting. Mr. Nicholas lets the children encounter the humorous and strange characters behind all 31 doors. It is exhilarating. , the question remains. What is it about the 32nd room that makes it so special? What is it that makes it worth all the mystery? What if Mr. Nicholas gave a really quick peek inside? 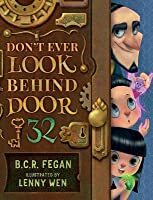 Don’t Ever Look Beyond Door 32 is yet another edition of children’s literature by the dynamic duo Fegan and Wen. The book is an excellent tool for learning how to count past ten. It mixes up fun with some education, which makes the lessons stick a little more. The intrigue that comes with every number makes this a favorite among the kids. B.C. R. Fegan has done a good job of writing up vivid and creative descriptions of the findings behind each door. With his words, he creates a sense of mystery and builds up anticipation for discovery. Children will enjoy the rhymes as they make for an enjoyable time. Rhymes can even be borrowed for the playground. Fegan’s writing gets better and better for the tots. His style is simple and appealing to the target demographic. Even the parents will find themselves wanting to jump to see whatever is behind the door. Lenny Wen is a master of illustration. The sheer amount of detail that goes into his illustration for this book is astounding. He allows the reader to see reactions to each revelation. The children in book look horrified and excited, as the situation requires which only works to improve the experience. He has managed to strike the perfect balance between creepy and mighty fun making this a Halloween gem. His illustrations contribute a delightful factor to the book. The characters on either side of the doors are interesting and excellent. The reader is treated to a nice array of zombies and ghosts among other creatures of the imagination. They are deep and incredibly vibrant. They are so vivid they jump off the pages and join in the tour which makes it all the more fun. The more the merrier, right? Trick or treat? This book is definitely a treat. You will concede to “read one more time” a few times but you will not mind because it is enjoyable. The ride is definitely worth it. The child will be treated to a fun filled adventure where they come out the other side with an ability to count past ten. Talk about super powers. . This book deserves five stars. Anytime someone tells you not to do something, why is it that our interests are suddenly piqued and something insides us makes us want to do exactly that? Telling children not to do something just makes them want to do it even more. In “Don’t Ever Look Behind Door 32”, author B.C.R. introduces us to the host, Mr. Nicholas Noo, that will be providing us with a tour of all the rooms in this magical hotel. Each room had something unique behind its door, making the hotel more intriguing. The two you Anytime someone tells you not to do something, why is it that our interests are suddenly piqued and something insides us makes us want to do exactly that? Telling children not to do something just makes them want to do it even more. In “Don’t Ever Look Behind Door 32”, author B.C.R. introduces us to the host, Mr. Nicholas Noo, that will be providing us with a tour of all the rooms in this magical hotel. Each room had something unique behind its door, making the hotel more intriguing. The two young children, a girl, and boy, are walking throughout the hotel and learning about who or what is behind every door. The hotel is large enough to shelter many magical creatures. One thing you’ll notice all creatures that stay at the hotel contribute in some way. Some provide special care to others, some help by providing maintenance of keeping the hotel clean, some cook and prepare meals for all guests in the kitchen, others just remain peaceful as to not disturb other guests. It is like a community within one building and that’s what makes it magical. Based on the title itself, you’re already wondering who or what could be just behind that door 32 and you hope to discover what is indeed behind it. Curiosity is the instant emotion you have prior to reading this book and you’re just as excited to read it. Mr. Nicholas Noo was a wonderful host, informing the two young children about each room and what all the guests do. I like that the children engaged with all the guests they were able to connect with, it brought on a feeling that they are easy to make friends with almost anyone. Door 32 has remained a mystery until the very end and no one would’ve thought who or what was behind that door. It made it into a more fun reading experience of taking guesses while reading. Raised on a small hobby farm only minutes from some of Australia’s greatest beaches, Fegan grew up inspired by the power of natures ambience. From the intensity of the frequent summer storms, to the overwhelming serenity of a lonely beach in the early hours of the morning. His r BCR Fegan is an award-winning author who has written a number of fairy tales and fantasies for children and young adults.